Seznam nejvýznamnějších SharePoint konferencí pro rok 2016. SharePoint Roundtables. In this session we will look at what is new within SharePoint 2016 and what does this really mean to you as an organization and ultimately to you as a user. In this webinar you will learn how a well-structured process can streamline everything. You will see how K2 can orchestrate this process and get your new hires on-boarded quickly before their 1st day. SharePoint administrators, end users, architects, developers, and other professionals that work with Microsoft SharePoint Technologies will meet for the 5th Annual SPS Events Salt Lake City event on February 20th at the University of Utah. Nintex Week, a four day event dedicated to helping you take full advantage of the world’s leading Workflow and Forms solution for SharePoint! This event consists of three courses taking place over four days. Attend SharePoint Fest – Denver, where you’ll be able to attend technical classes and workshops – taught by Microsoft Certified Trainers, Microsoft engineers and Microsoft MVPs – covering Enterprise Content Management, Power Users, Social SharePoint, Business Value, Implementation/Administration, Office 365, Workflow, Business Intelligence, Special Topics & SharePoint Development. Choose one complete learning track or mix & match based on what content best meets you and your organization’s current needs! SharePoint 2016 In Context: What This New Release Will Mean To You! SharePoint 2016 changes for the IT Pro, SharePoint 2016 changes for the user, Hybrid cloud/on-premises strategies, Upgrade path and timeline. Join SVP of Product Strategy John Peluso and learn: Top reasons to move to SharePoint 2016, SharePoint migration challenges and technical considerations, Options for migrating to SharePoint 2016, Best practices approach to SharePoint migrations, Optimizing your SharePoint 2016 migration. In this 2 day clinic you will get hands on Training on the new features and deployment options for SharePoint 2016 on Premises. You will get your own Virtual Machines to allow you to build real world configurations during the two days and instructor led demonstrations and discussions. We’ve gathered a team of solution experts to share their perspectives, guidelines and best practices on optimizing processes and automating workflows to improve business outcomes. Through case work examples you’ll gain an understanding of Neudesic’s approach that puts process simplification first, before focusing on the technology. SharePoint administrators, end users, architects, developers, and other professionals that work with Microsoft SharePoint Technologies will meet for the 3nd SharePoint Saturday (now called Office 365 Saturday) in Denmark event on March 12, 2016. Join SharePoint, Office 365 and Azure architects, developers and information workers for our 3rd SPS Events – Chicago Suburbs on March 19th, 2016 at the DeVry University located at 1221 N Swift Rd, Addison, IL 60101. Convert SharePoint 2013 into a mobile friendly web site. This course will help jumpstart your responsive design efforts within SharePoint (2013 and SharePoint Online) and provide you valuable skills and resources to ensure your development process goes as smoothly as possible. SharePoint Saturday is an educational, informative and lively day filled with sessions from respected SharePoint professionals and MVPs, covering a wide variety of SharePoint-oriented topics. SharePoint end users, administrators, architects, developers, and other professionals that work with Microsoft SharePoint Technologies will meet for the 4th Annual SharePoint Saturday-Omaha event on April 9, 2016 at Mammel Hall, located on the UNO Campus at 6708 Pine Street, Omaha, NE. Vážení kolegové, členové komunity, SharePoint profesionálové, zveme Vás na zajímavou jedno-denní akci v Brně, která se bude konat 20. 4. 2016 v krásných prostorách Brněnského Impact Hubu na Cyrilské ulici, č. p. 7. Čekají Vás přednášky zaměřené na platformu Microsoft SharePoint a s ním související technologie vedené specialisty ve svém oboru, několik doprovodných akcí jako kvíz nebo povídání s hosty a drobné pohoštění. Internet je v celých prostorách Impact Hubu dostupný zcela zdarma, občerstvení je zajištěno a parkování zdarma je možné pouze v přilehlých ulicích, prostory Impact Hubu disponují pouze 15ti místy za budovou a v garážích. Zaujali jsme Vás? Přihlaste se! Using SharePoint to foster collaboration, increase employee engagement, & drive business results. Whether you are an early adopter of the latest SharePoint 2013 or a few years behind, we will have several real-world examples showcasing roll-outs at different stages. 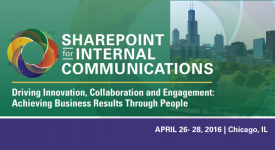 Join us this spring in Chicago to hear first-hand from your peers on how they are overcoming challenges with SharePoint, as well as successfully leveraging the power of this tool to drive both communication, engagement, and value to their organization. Attend SharePoint Fest – DC where you’ll be able to attend workshops and seminars – taught by Microsoft Certified Trainers, Microsoft engineers, and Microsoft MCM’s and MVPs – covering Enterprise Content Management, Implementation/Administration, Business Value, Search, Business Intelligence, Office 365 and SharePoint Development. Choose one complete learning track or mix and match based on what content best meets you and your organization’s current needs. At SharePoint Fest – DC, there will be sessions created for SharePoint administrators, software developers, business analysts, information architects, and knowledge workers; which will ensure that you and your team walk away with as much knowledge as you desire to truly leverage SharePoint in your current environment. SPTechCon: The SharePoint Technology Conference – is the largest independent SharePoint conference in the world – for IT professionals, business managers, analysts, and developers. Choose from more than 90 Classes and Tutorials!!! Learn from the brightest minds in the SharePoint universe – more than 40 Expert Speakers and Microsoft MVPs! IT/Dev Connections offers a unique combination of training and networking without the sales pitch. 100+ expert speakers who provide the „official word“ and an objective view on today’s critical business technologies. The ability to customize your learning experience with 5 tracks and 190+ sessions to choose from. Fresh, practical content and in-person demos based on real-life deployment experience. Network with speakers, vendors, and peers. The European SharePoint Conference is an outstanding opportunity to influence the hearts and minds of over 1,500 Developers, IT Pro’s, Entrepreneurs, Tech Enthusiasts and Business Decision Makers from around the world. The conference features four action packed programme days covering Office 365 and SharePoint – one day of tutorials and three days of sessions on eight separate stages, in addition to several side events including networking sessions, panel discussions, hackathon, soap-box sessions and workshops.